These rooms have a capacity for 2 to 8 people, are provided for students to work together on coursework. The rooms may be booked online up to 1 week in advance and for 2 hours at a time. They comprise a variety of flexible seating and furniture arrangements with state-of-the art AV facilities. 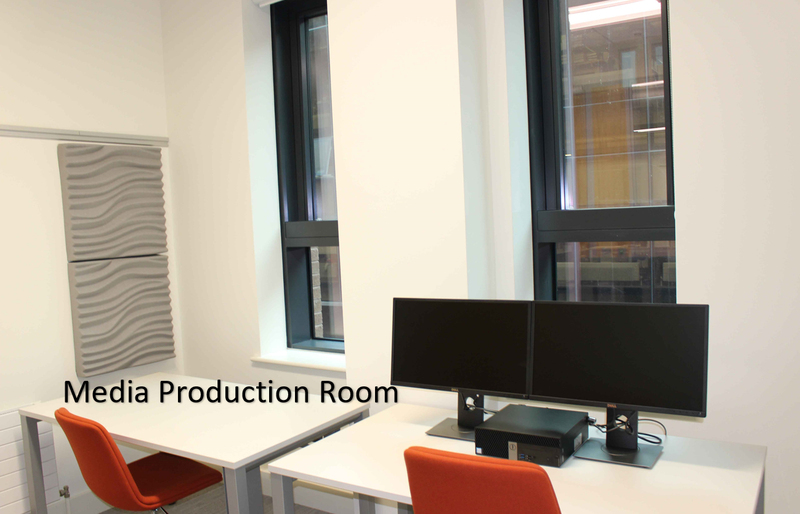 The Media Production Room can be booked online up to 1 week in advance, it has a capacity for 2 people. 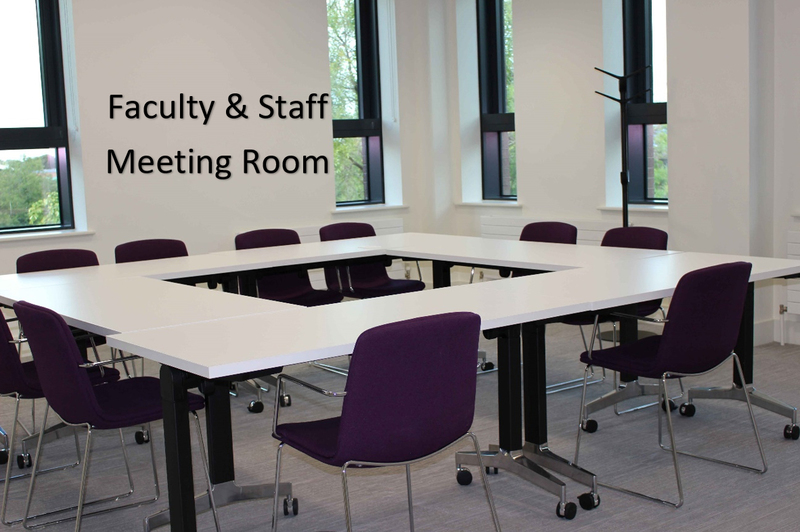 There are 7 meeting/training rooms that can by booked by faculty & staff for learning purposes. Four rooms with a capacity for 4 people and are provided for the purposes of group work. The rooms may be booked online up to 1 month in advance and for 4 hours at a time. You will need a staff ID card to get into the general meeting space on Floor 2 in order to access these bookable rooms. 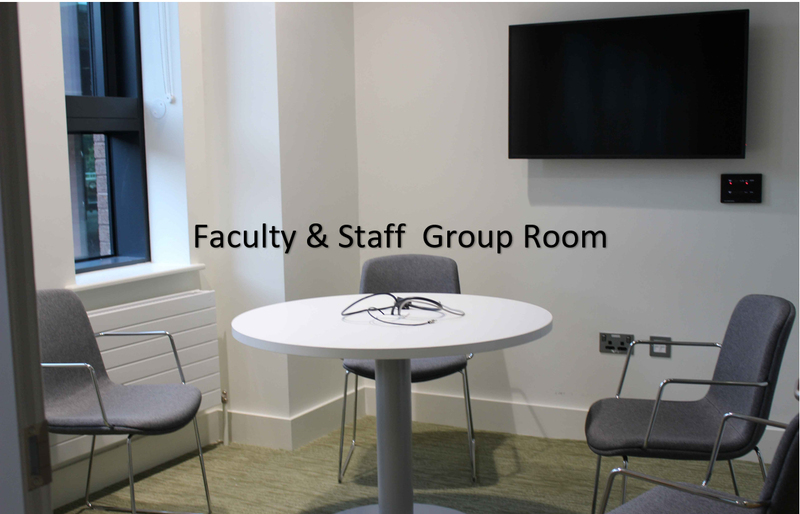 There is a general faculty meeting/reading space adjacent to these group rooms, where faculty/staff can relax, meet other faculty/staff, read a newspaper, study etc. This is open to all faculty/staff for learning purposes. Access is via swipe ID card. This is not a bookable space. There are also 3 larger rooms that have a capacity for 12- 16 people and are provided for faculty and staff for the purposes of group work. These rooms may also be booked online up to 1 month in advance and for 4 hours at a time. 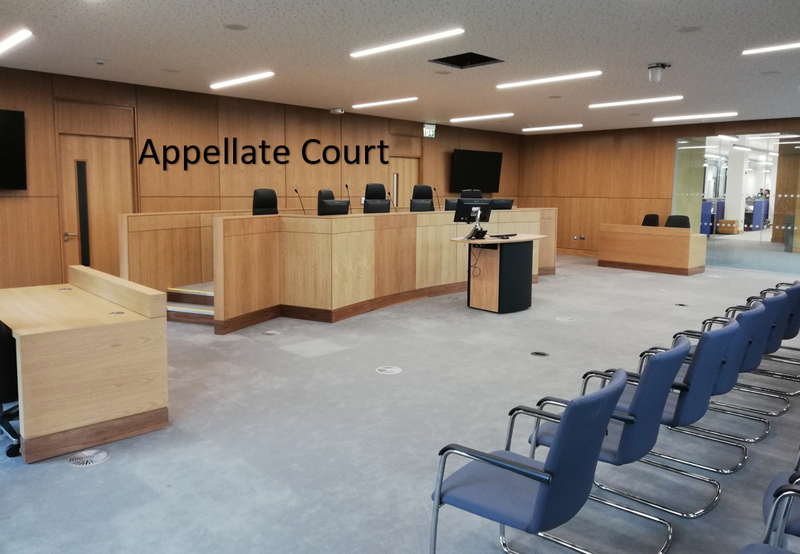 The Appellate Court (48 capacity) can be booked online and these bookings are mediated by the Library. Indicate the date and time of your event and submit your booking form, free time slots are in green. After you have submitted your booking form, the Library will email you with a decision. 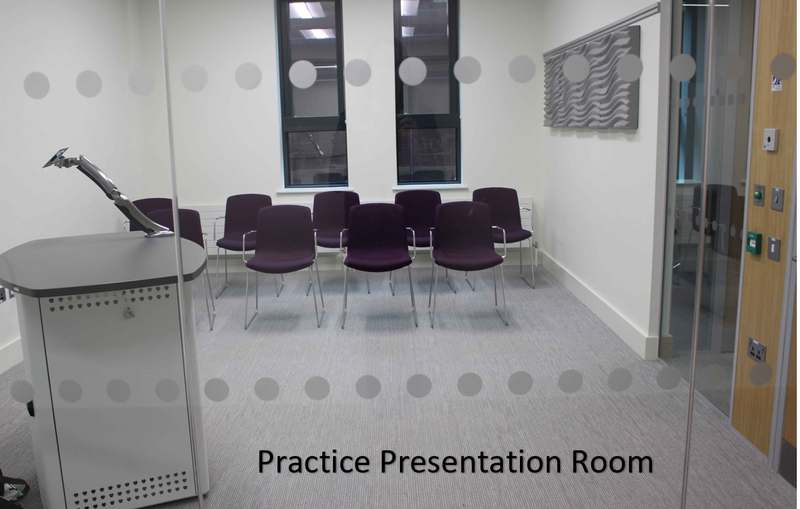 The large training room (GL0-046) accommodates 28 people and the small training room (GL0-008) accommodates 10 people. These rooms are managed by the Information Technology Division. Use the ITD log a call facility to enquire about booking these rooms. *Please keep a copy of the confirmation email, sent from LibCal after making a booking as this is proof of booking and supplies a cancellation link, if needed. These rooms are provided for collaborative/group work e.g. course assignments, projects, research, presentations, group study, faculty and staff meetings, etc. Library staff do not mediate bookings (except for the Appellate Court), please ensure you have entered in the correct details and taken note of the room number and time of booking. These rooms are not appropriate for: recreation, individual use, interviews, private tuition/grinds, scheduled tutorials or teaching purposes, office space, external training or commercial use etc. Rooms cannot be booked on a long term or recurring basis e.g. weekly, monthly. 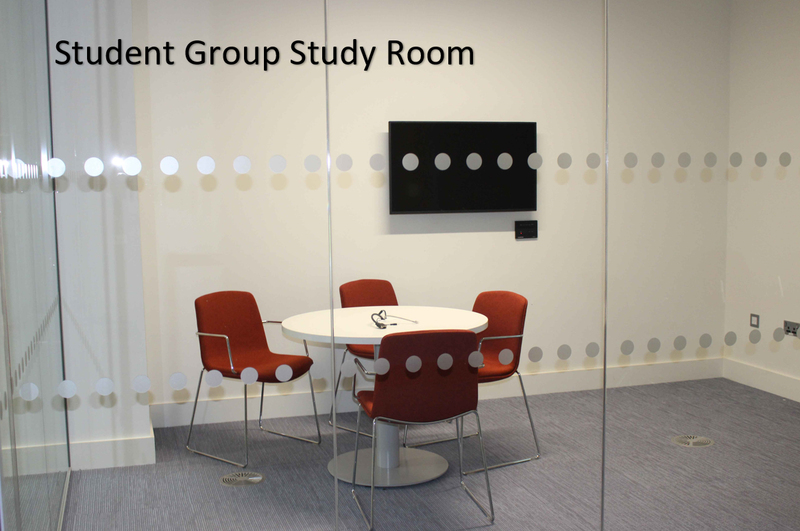 As the rooms are in high demand during term-time, if a group is more than 15 minutes late, another group may use the room until the next bookable slot. Anyone using these rooms without a booking must leave when requested by a group who has a reservation. Rooms cannot be reserved or 'held' by placing personal belongings in them. Any unattended belongings may be removed. It is strongly encouraged that rooms are used to maximum capacity as indicated on booking. Individuals may be asked to leave if the room is under or over capacity limits at busy times. Users of these rooms are requested to keep noise levels to a minimum and to leave the room in a clean and tidy condition. Personal belongings and library material must be removed upon vacating the room. Hot food is not permitted in these rooms. Litter must be disposed of responsibly. You may rearrange the furniture layout to suit the needs of your group but please do not move furniture from one room to another. Library staff may enter the rooms as needed for security, maintenance or other reasons.